We’ve seen them on the runways of children’s fashion shows, in magazines and on celebrity babies such as Honor Warren and Harlow Madden. 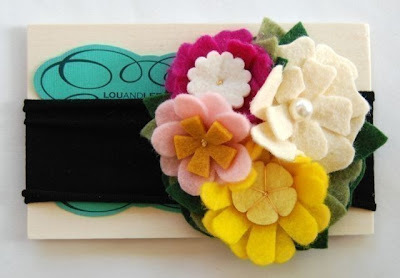 Headbands are all the rage and have been growing in popularity! 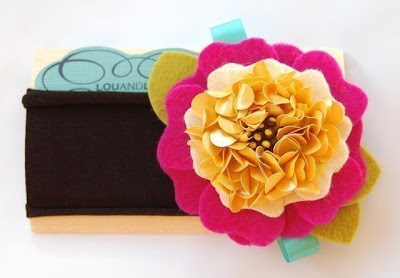 Our pick for these hip accessories is Etsy’s Lou & Lee . 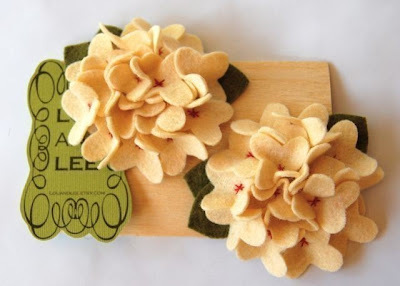 Designed by two sisters, Lou & Lee sells hand cut, custom-made vintage flower felt headbands and hair clips that are made in sizes that fit babies, children and adults. These hair accessories are trendy, fun, hip and reasonably priced ($14-21). Have you heard of Umi Shoes? They were recently featured in Baby Couture‘s Fall 2009 issue where Joely Fisher’s children sported a couple of their new styles. I recently purchased a couple pairs for my daughters and was impressed all around. They are solid and made out of high quality nappa and nubuck leather. The soles are flexible and the width is perfect (unlike many children’s shoes I have tried). Both my 12 month-old and 3-year-old love them and walk in comfort. The Lissy has given my new walker an incredible amount of support and I love the rubber “bumper” at then end of the shoe as it prevents stubbed toes. Honestly, these are probably the nicest shoes I have every purchased for my kids! The cost ($38-93) is somewhat higher than most kids shoes however they are made to last and can easily be handed down to siblings or family members. Umi uses non-toxic materials which are built to last. All the leathers are drum-dyed and tested for colorfastness and wear-resistance. Chic celebrity parents such as Candace Cameron, David Letterman, Jessica Alba, Kelly Ripa, Tori Spelling and Jennifer Garner are just a few of the many Umi fans! You can purchase Umi directly from their website or visit their list of retailers for a store in your area. Jennifer Garner and her adorable 4-year-old daughter Violet were photographed last month (January 23) as they make their way to the Walt Disney Concert Hall in Downtown Los Angeles, CA . Violet was smiling for the paps while clutching her Fisher Price Kid Tough Digital Camera in pink. Her beautiful outfit – all from Crew Cuts! All pieces can be purchased through J.Crew’s Crewcuts. We love this swanky bling playset from Pink Taffy Designs! The Long Sleeve Lap-T is embellished with Swarovski Rhinestones featuring your Little Princess’ Name and optional matching Yoga Pants featuring her Monogrammed Initial(s)! This darling helicopter bank is the perfect way to keep your babies pennies safe. Silver plated, with moving rotors, this bank measures 4″x 5″ and would make a sweet baby gift! Jointly developed by HUGO BOSS and CWF, the new BOSS Kidswear collection will address upbeat girls and boys from 4 to 16 years old. Boys have many pieces and styles to choose from thanks to the four lines offered: from premium chic to casual fashion, lifestyle or sporty. The different lines can be featured individually or mixed for a unique BOSS style.